Wight Classics is pleased to announce a new association with Aldridge Trimming, a family run business that has been established for well over half a century and three generations. Established in 1931, Aldridge is one of the Uk’s largest car upholstery specialists and has featured regularly on ‘Car S.O.S.’, National Geographic’s popular classic car TV programme, providing the right trimming solution for Fuzz and Tim. 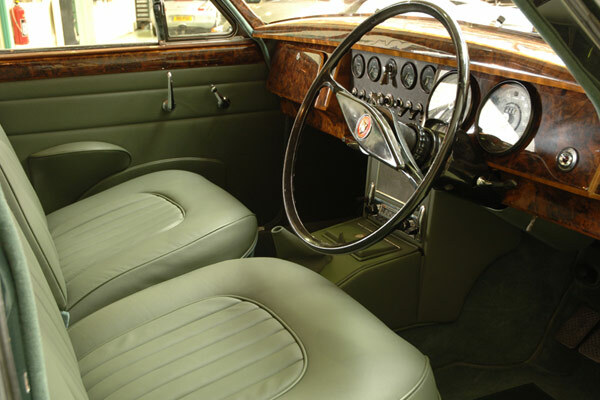 Originally Aldridge mainly focussed on interior trim for Jaguar cars from the 1950s onwards, but now supports Austin Healey, Triumph, Mercedes (from 1964 onwards) and Ford cars from the 60’s and 70’s era. They can also manufacture anything from a sun visor to a complete interior trim set for virtually any classic car where the original patterns are supplied and they are constantly adding to the trimming product range. Aldridge Trimming is recognised as a leader in the provision of high quality car trimming services. Quality is established in all aspects of its operation. Relating to materials, high quality hides and interior materials are sourced from leading suppliers to ensure a truly high quality, professional finish. Many of the 18 staff at Aldridge Trimming have had considerable previous experience in the trimming industry and must have at least two years specific experience at Aldridge’s before being allowed to work on an interior restoration without supervision. Simon Aldridge individually supervises all in-house projects and must review and approve the quality of the completed job prior to collection of the car by the customer. Wight Classic will work with Aldridge to specify your classic car requirements and with our local trimmers to ensure an expert fit. If you are looking to improve the interior of your classic car then why not talk to us today and see how Wight Classics can help? Service your car and engine including our annual safety inspection. Full Restorations, Partial Restorations, From bare shell to completion. We use only the finest Evans Waterless Coolants, and Penrite Oils. We use Google Analytics to build better user experiences for future visits. Google Maps help enhance your experience using maps and directions within the site.